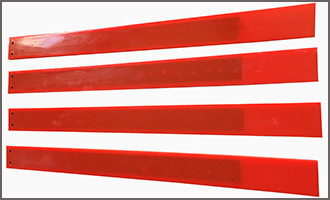 Polyurethane Finger seals are readily available for blasting equipment in lengths from 22" to 48". KOSIN offers finger seals in a wide variety of colors. 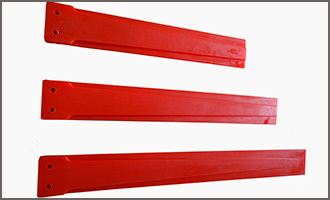 Urethane Finger seals are ideal for applications requiring containment of avrasive media. The urethane seal recoils to its original shape after pass through the opening to be cleaned. Some blast cleaning rooms have an entrance and an exit requiring urethane seals on both sides. The spring-loaded steel insert provides exceptional memory allowing finger seals to snap quickly back into postion.